A Boston Food Diary: Win a Nespresso UMilk! 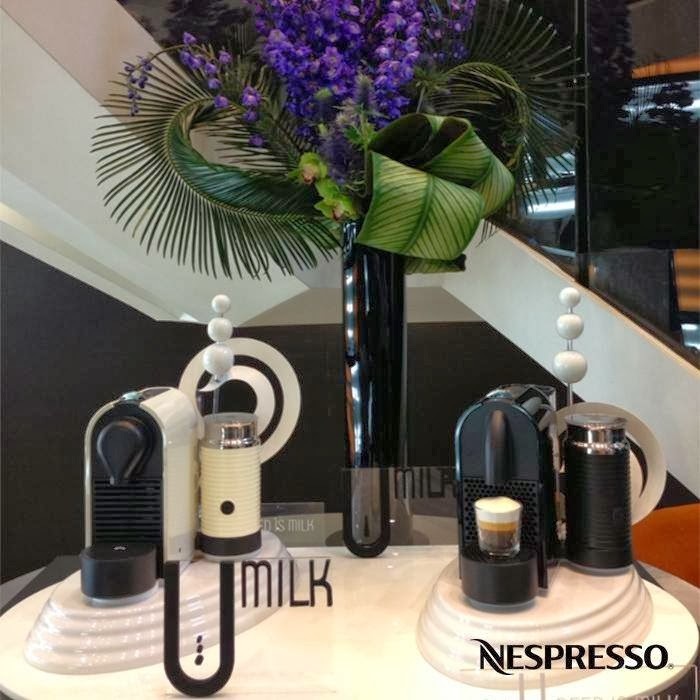 Have you visited the Nespresso Boutique on Newbury Street lately? A couple of months ago they re opened a newly redesigned space. The new space allows us to shop the full Nespresso line of machines, try out their newest or oldest crus, and purchase our favorite coffees, as well as now giving us the opportunity to order one of their delicious coffee drinks, and a full menu of delicious breakfast and lunch items. If you haven't yet paid them a visit, I urge you to soon. Whether you own a machine or not, the boutique presents itself as a bit of an oasis, like giant sigh of relief hits you as you enter the store. The whole experience is relaxing, and indulgent. As lucky as we are to have a Nespresso Boutique here in Boston, Nespresso's ultimate goal is to help us all achieve the same feeling of relaxation and indulgence within our own homes. Their machines are designed to fit any decor, any space and each is designed to produce the perfect cup every time you use it. In honor of this holiday season, when, lets face it, we all need a little more decadence in our lives, Nespresso has offered to send a reader of A Boston Food Diary a brand new UMilk machine! Combining the space efficient design of the U Machine with an Aerocinno machine, the UMilk makes the perfect espresso, latte and cappucino over and over again- the best way to wake up after that holiday party or end your favorite meal. To enter, please leave me a comment describing your favorite way to relax during this busy time, as well as your name and email address. The contest will run until 5:00 pm EST on Monday, December 9, 2013. Please be 18 years of age or older, and a legal US resident to enter. A nice glass of wine or Sake will help to wipe away the anxieties of the day. It can also be shared with others, to help them relax too. And soon enough, you might even have an impromptu wine party. A quick gym session, a long shower, and coffee and the Boston Globe on a slow weekend morning. My favorite way to relax is a long steam after a great workout. Sadly, my gym has prohibited drinking a cold beer in the sauna. Oh well, I guess you can't have it all! My favorite way to relax is definitely sitting in front of the fire with a glass of wine. I love to either sit somewhere where I can watch the waves at the beach or walk along the shoreline. If I'm sitting I might enjoy an iced drink or a glass of fine wine. If I'm walking, I like to walk just where the waves meet the beach and watch it flow in and out. My favorite way to relax is to have a glass of red wine while watching any holiday comedy movie with family and friends! My favorite way to relax is to bake, preferably any type of dessert, and to treat myself to a massage. I relax in front of TV with teddy bear(s) companion(s) and enjoy wine and dessert - cookies I've baked, puddings or pies. I like relaxing before the TV with teddy bear(s) pals and sipping wine, maybe with cookies, pie or pudding I've made. Making a cup of coffee and reading a book on the sofa is the best!